Chicken Noodle Soup - Chocolate Chocolate and More! Homemade Chicken Noodle Soup-is there anything better on a cold day? It’s time for the Crazy Cooking Challenge again. This month’s Challenge-Chicken Noodle Soup. Remember, the only qualifications are, you must get the recipe from another blogger, make the recipe then post about it. Then the light bulb goes off in my head, go to some of your favorite foodie friend’s blogs and see if they have a post. Success, on my first look. My dear friend Carrie at Carrie’s Experimental Kitchen has exactly what I want. It’s her Chicken Ditalini Soup, Ditalini is just a specific kind of noodle. So Crazy Cooking Challenge here we go! So I picked up on her recipe at the Chicken Stock water. After removing the meat from the skin and bones, I placed the skins and bones into a saucepan. I added about 4 cups of water, making sure to cover the top of the bones, and simmered on a low heat for 2 hours. I placed my cut celery, carrots and oil over a medium heat (you should also place your onions but I used minced onions to avoid 12 year old rants about seeing onion in her soup.) Saute until celery and onions begin to become translucent. Add chicken, chicken broth and chicken stock to your pot. Bring to a rolling boil then reduce heat to simmer for about 45 minutes. Add noodles (I probably used about a cup of egg noodles) and cook for another 15-20 minutes. I have to tell you, my hubby says this is the best soup I have ever made. So thanks Carrie, this was delicious, simple and easy! If you like this recipe, be sure to vote for my post by clicking on it (#17) and check out all the other great versions of Chicken Noodle Soup! Great choice, Joan! Good idea to search blogs you know and love. I always start by doing a keyword search on my Google Reader. FYI: there’s no voting anymore. Whichever recipe gets the most clicks is the winner. Great looking stock and soup! Oh yes, there’s so much incredible flavor in those pan drippings! 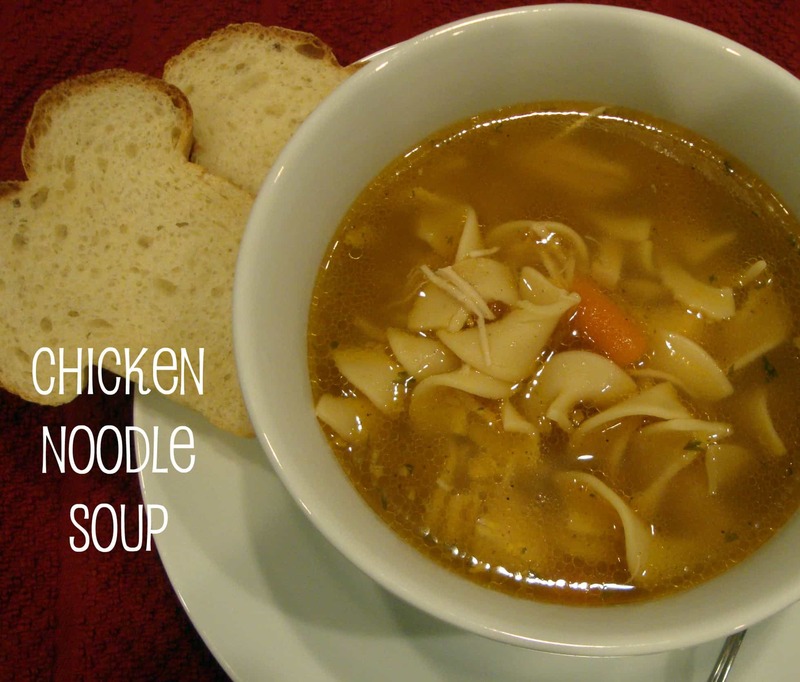 Happy CCC – hope you’ll visit my post for Southwestern Chicken Noodle Soup (#48). I had a hard time finding a recipe too! I love to make homemade stock also….don’t want to waste all the drippings and such, and it just tastes so much better. Your blog is so cute! Glad to be a new follower from CCC! I love the homemade chicken stock. I makes everything taste better! Great recipe! This is a warm and inviting soup. Yum. I’m coming down w/ a cold, so this looks extra fabulous to me! Thanks for sharing at Church Supper. Have a blessed week, and see you next Sunday! LOVE homemade chicken noodle soup. And this looks amazing! I made Creamy Chicken Noodle Soup! #1 in the linky party, come by and visit if you get the chance! Thanks again for participating in my challenge!